Space suits are used by astronauts that are in space. They are needed because the atmosphere in space is not breathable for humans and does not contain any oxygen. Astronauts move around outside the shuttle by wearing things called, Space Suits. There is no gravity in space which causes the astronauts to float around. 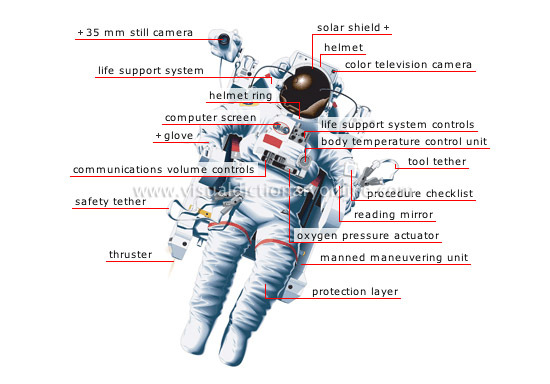 The space suit is made up of many different parts. One part of the suit covers the astronauts chest, while other parts cover the arms and connect to the gloves. There is also a helmet that protects the head, and a part that covers the astronaut's legs and feet. Some parts of the suit are made up of many layers of material. Each layer of material in the suit does something different, from keeping oxygen in the suit, to protecting the astronaut from space dust that can be harmful. Under the big bulky suit contains a piece of clothing that covers the entire body, except for the heads, arm, and feet. Tubes are woven into it where water then flows through them to keep the astronaut cool. On the back of the space suit contains a backpack that supplies and holds the oxygen so the astronaut can breathe. As well as removing any carbon dioxide that the astronauts have breathed out. The backpack also supplies electricity for a fan that moves the oxygen through the entire space suit, as well as the water tank that holds the cooling water. In addition to the back of the suit, there is a tool called a SAFER that has several small thruster jets. That way if the astronaut ever floated away, they can use the SAFER to get back.